The latest issue of “Women’s Infoline,” the newsletter of Women of Grace USA arrived today, and it included the announcement that Sarah Dompier (pictured) from Eagle River, Alaska, is the latest Honor Her scholarship recipient. 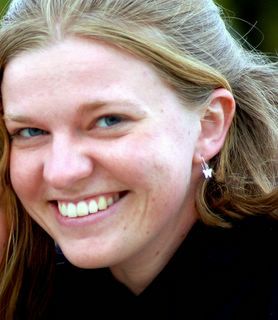 Honor Her scholarships help young women from Grace College, Winona Lake, Indiana, to participate in short-term missions. This gives them an opportunity to explore the possibility that God may be calling them to invest their lives in full-time missionary service. Funding is provided through offerings given by Grace Brethren women in honor of women who have been an example of investing their lives in God’s service. Sarah is being awarded $1,000 to help her be a part of the Philippines GO team this summer. She is a May, 2006 graduate of Grace College, with a double major in English and Biblical Studies. She has taken several previous trips with Grace Brethren International Missions, including three trips to France. She interned in Paris for a semester with Dennis and Jeannie Martin and Tom and Doris Julien. She says, “I plan to use this trip as a further catalyst for my personal passion for missions, especially with leading and motivating teams of young people. I hope to help light and stoke the fire for ministry in the hearts and lives of my generation. The newsletter also announces that the Women of Grace 2006 “Project of the Year” is raising money to renovate the Grace Brethren missionary residence in Winona Lake. The four “Missionaries of the Year” for WGUSA are Beth Bryant in Canada, Becky Good in Cambodia, Ruth Ann Martin in Argentina, and Letitia Yoder in Germany. The Women of Grace website is currently under repair, but communications may be e-mailed to womenofgraceusa@aol.com or sent to PO Box 711, Winona Lake, IN 46590.